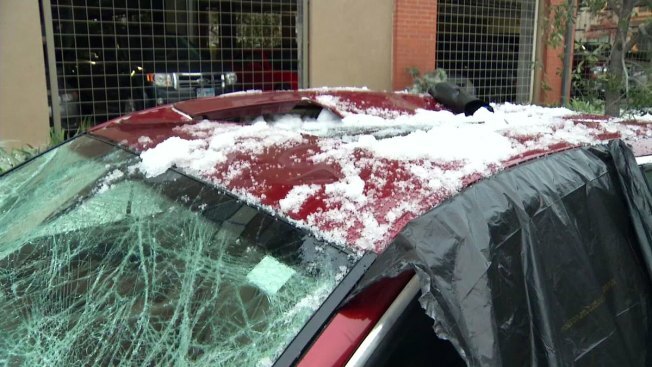 Falling ice damages cars in Plano. Losses from the massive multi-day ice storm that paralyzed North Texas could reach up to $50 million when totaled. Early estimates from the Insurance Council of Texas said the ice storm cost North Texas $30 million in residential insured losses. The losses include anything from trees that fell into homes, broken pipes and/or flooding damage and other weather-related losses. The group said that early estimate doesn't include losses to cars, roadways or city property. The council said they do not expect insured losses from vehicles to be significantly large as most crashes and damage seem to be minor. Most drivers elected to stay off of treacherous roads during the ice event, leading to a lower estimate for car damage. The cost to cities and counties is also significant with Dallas and Tarrant county judges estimating around $2 million combined to clear the ice. Dallas County Judge Clay Jenkins estimated the total cost of the ice storm to be around $1.8 to $1.9 million. That estimate included loss of productivity for shutting down county offices as well as expenses for clearing roads. However, Jenkins said the estimate does not include increased costs incurred by Parkland Memorial Hospital for weather-related injuries. Tarrant County Judge Glen Whitley estimated the total cost as around $500,000 at the annual State of County event on Wednesday. In his figure, Whitley included manpower overtime, sand, salt and other measures used to free the county from the ice.